I managed to get totally caught up on pattern writing over the weekend, and I'm almost finished with the body of my orange Finn! 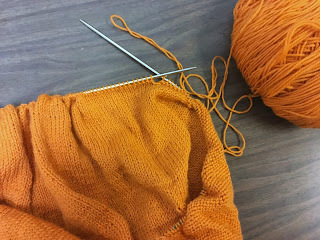 I just started the garter stitch hem last night, but after knitting almost four inches earlier in the day I was just too pooped to keep going. I'm hoping to finish it today, and to pick up the first button band, but we'll see what I have time for. I have to move some things around in my apartment tonight so my friends can help get get my piano moved in from my parent's house on Tuesday, but that shouldn't take too long. This weekend I also managed to try some new things! I made tuna onigiri for the first time, and I also cooked a spaghetti squash on my own for the first time! I was expecting the onigiri to be more difficult than it was, since I don't have a mold for it, but it turns out keeping your hands wet makes everything go smoothly. I almost cut myself a couple times while cutting the spaghetti squash, but fortunately I made it through the experience unscathed. Happy Friday! I'm definitely ready for the weekend. 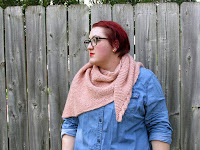 I have two patterns that I'm hoping to finish writing and send off to my tech editor, so I've already set aside Saturday as pattern-writing day. Sunday afternoon one of my friends is getting ordained, so that's a big chunk of that day set aside as well. In between all that, I'm hoping to get some nice quiet sitting and knitting time fit in. My Finn is coming along nicely. I have a few more rows left on the body, and then I'll need to find a smaller needle to do the hem, collar, and button bands. 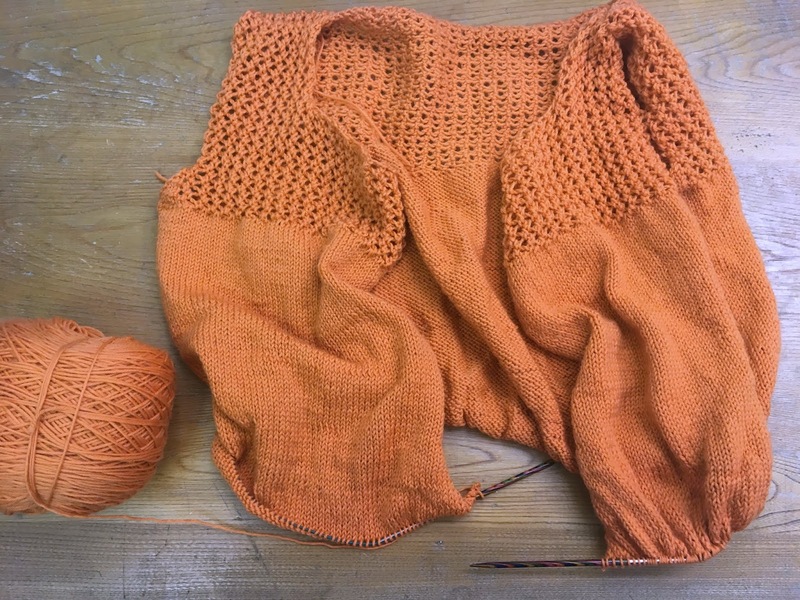 The sleeves felt like they took forever when I knit the sample, and I'm hoping they'll go a lot more quickly this time around. 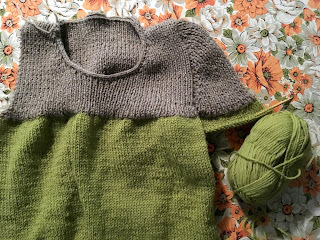 The Summer Sweater KAL has three more weeks in it, though, so I should be able to finish in plenty of time. Over the weekend I managed to finish BOTH my green sweater and my green cowl, so I'm finally able to get back to work on my Finn. 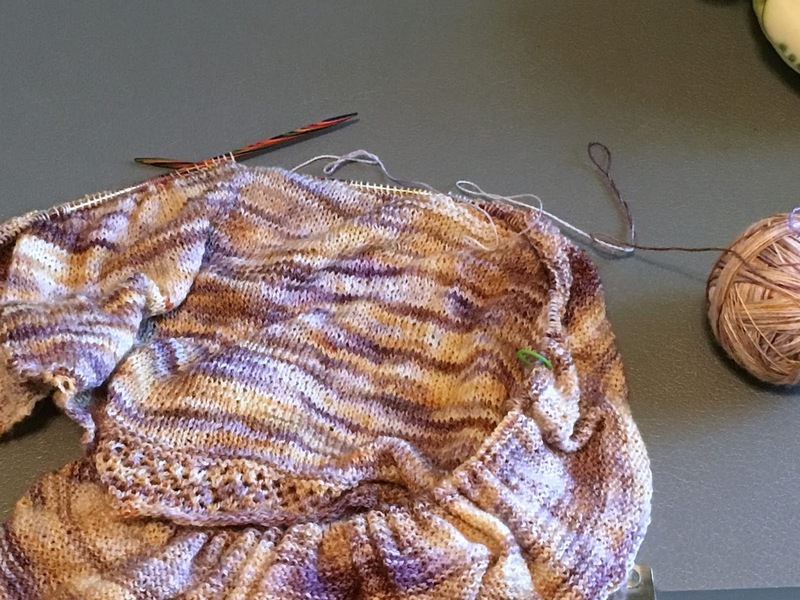 I started this back in the spring, and despite enjoying knitting it and really wanting the finished sweater in my wardrobe, I let it fall aside. 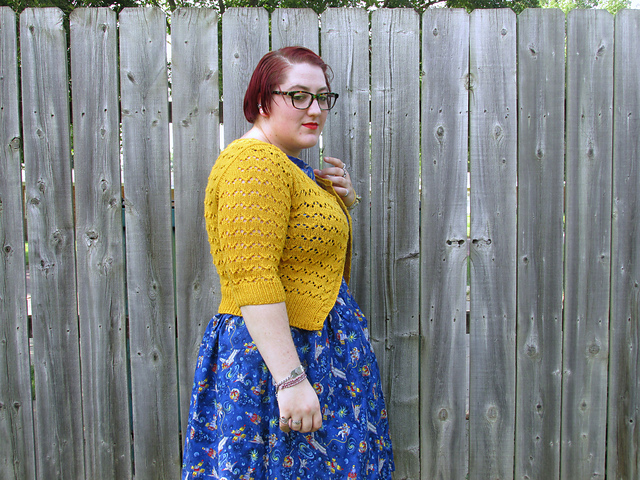 The Summer Sweater KAL is the perfect excuse for me to pull this back out and finish it up in time for fall. Last night I had a great visit with my mum. We made BLTs, had some wine, knit, and watched some British mysteries on Netflix. We used to spend most evenings together when I was living at home, and I miss that sometimes, so it was great to have a night in with her (and the dogs!). Pretty much all the students are back in town now, and campus has definitely gotten busy. Choir rehearsals start up again tonight, and I'm looking forward to hanging out with my fellow singers again. It's nice to have summer off, but I definitely miss singing regularly, and my choir is such a great group of people, and I miss hanging out with them twice a week. 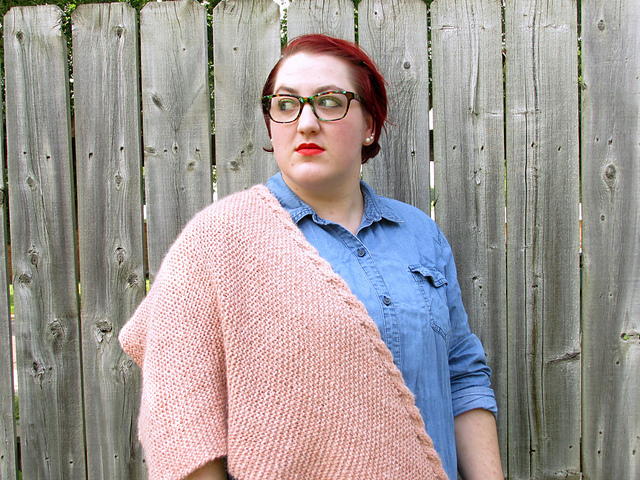 Overfar is a cozy reversible shawl that will follow along with you wherever you want to go. 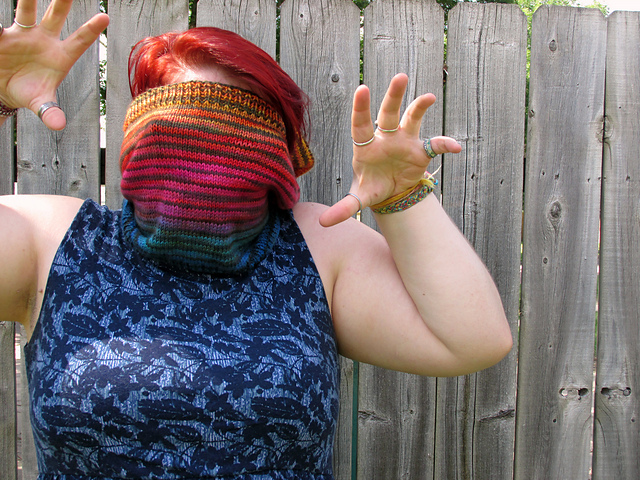 Overfar is now available on Ravelry, and is 20% off through Saturday, August 25th! This weekend is move-in for the college, which means town is very full and very busy. I'm planning on holing up in my apartment and not leaving unless I absolutely have to. My best friend just sent me the codes for the digital copies of movies she recently bought that I haven't seen yet, so I'm looking forward to a movie marathon and some serious knit time. 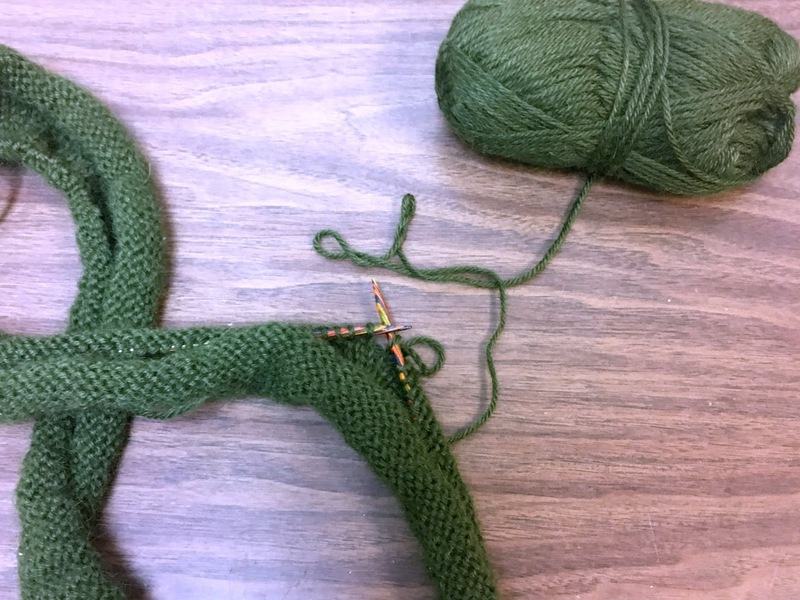 My green sweater hasn't been a good lunchtime project this week, since it's getting so large and I needed to check the sleeve math a couple of times, so I've been keeping a new sample in my purse. 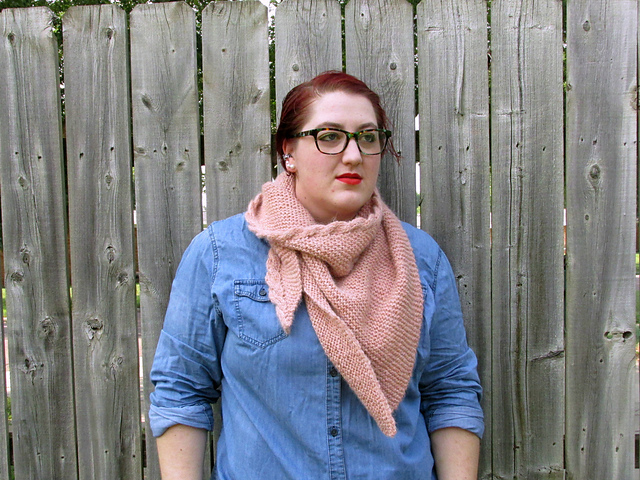 My friend sent me this yarn during a destash, and it's perfect for a double-layered cowl I've had floating around my head for a few months. Right now it's just endless knitting in the round, but once I reach the halfway point I'll be able to start the fun stuff. 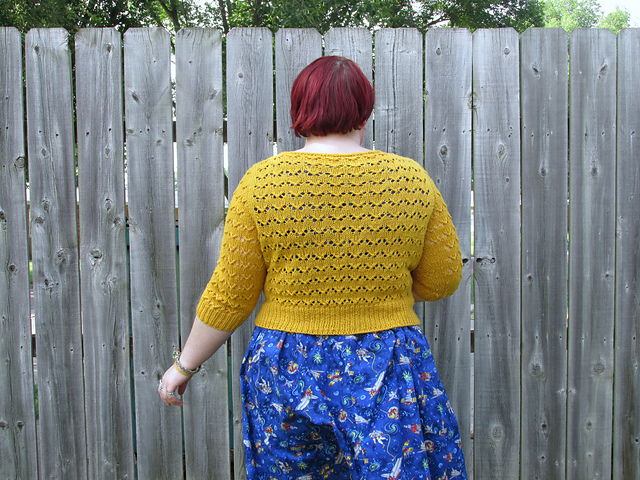 I made some decent progress on this sweater over the weekend. 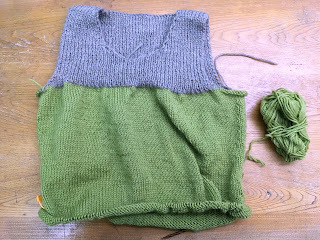 I'm on the first sleeve now, and I should be able to get the second sleeve started before the weekend. I also finished all the math for the pattern, so I'm hoping to actually start writing the pattern this week. 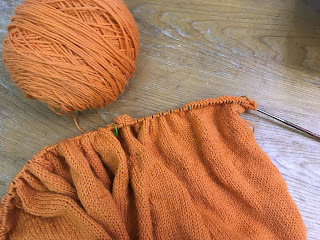 Today is the first day of Shannon's Summer Sweater KAL, and I'm hoping to finish this sweater as well as the orange Finn I started back in the spring. I'm not worried about finishing this one, since it's been going so quickly so far, but Finn has just over half a body and full-length sleeves, so I'm not sure if I'll get that one finished by the end of the KAL. 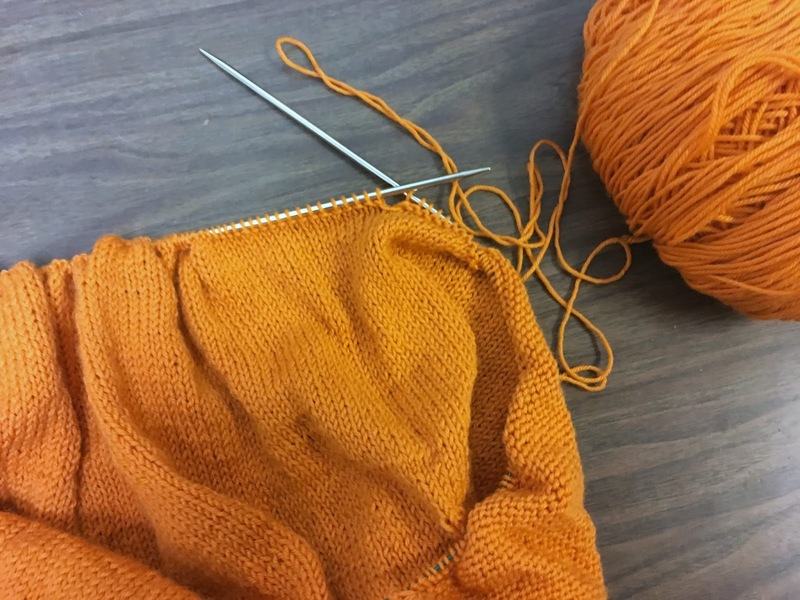 Either way, it's always a fun group to knit along with, and even if I don't get both sweaters finished, I'll be well on my way to having some new knits ready before it gets too cold out. 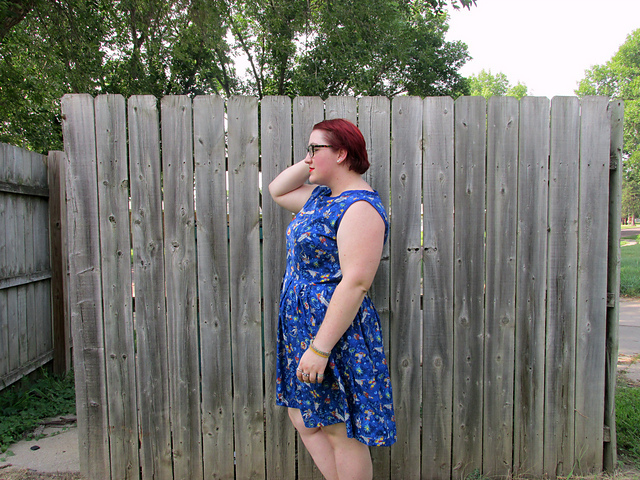 The OAL has been over for almost two weeks, and I only JUST got FO pics! I had such a blast this year, and I'm beyond thrilled to have finally finished both projects within the time frame. 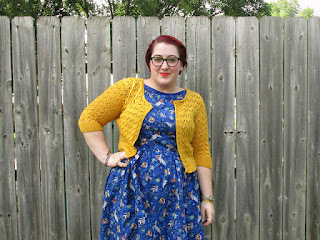 I love my sweater and my dress, and I'm definitely going to be wearing them both a lot. Up first, the dress. 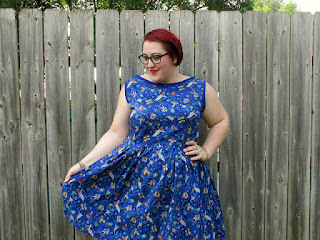 This is New Look 6392, view A, in an astronaut-print quilting cotton I found at the thrift store this spring. 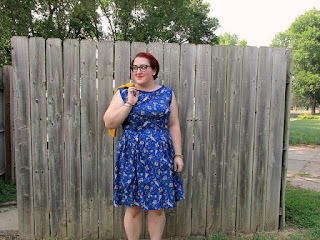 I used bias tape instead of the neck and armhole binding in the pattern because after trying out the written binding on the neckline I didn't love it. Part of that might be due to the fact that the neckline is too wide on me- the upper chest and upper back are a smidge too big, and I didn't fix it before hand. I have an idea to try out some pleats along the neckline to bring it in some so it fits a little better, but it's really only noticeable to me and my sewist friends. 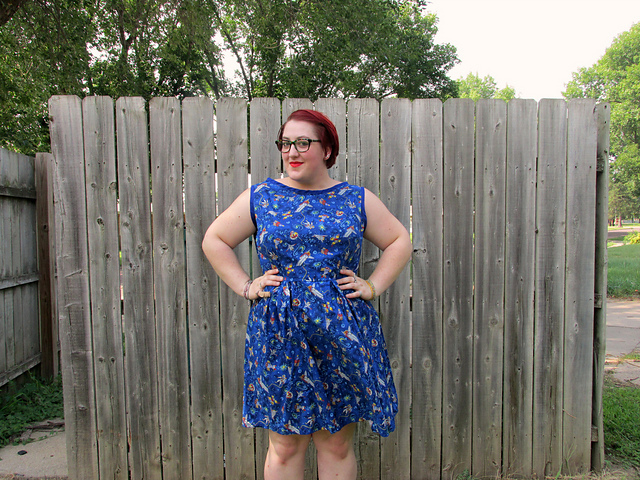 I also modified the dress to have a side zip. The pattern calls for a back zip, but I am single and not flexible enough to do a back zip on my own, so, it had to move. I'm pleased with how the zipper looks, given that I had no clue what I was doing and I pretty much just made it up as I go along (am I supposed to use a special foot for a zipper? I feel like I probably am.). 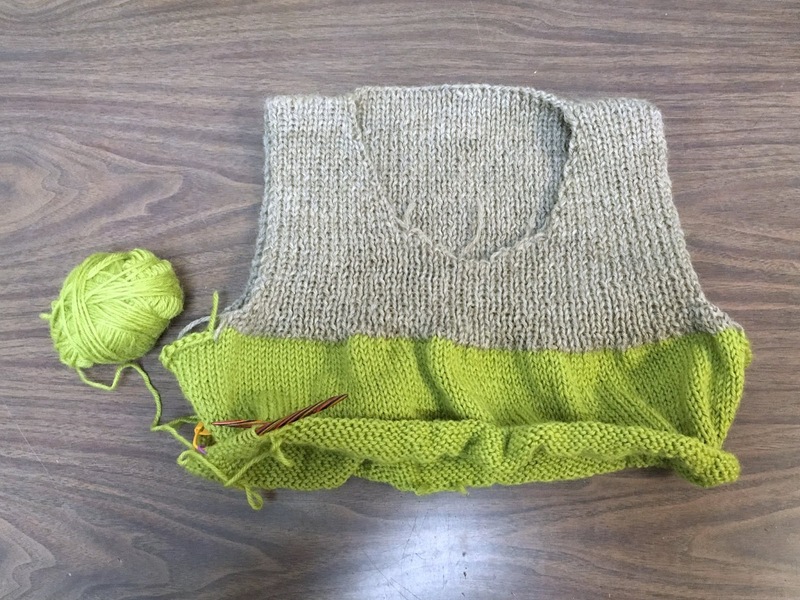 My sweater is Hetty, which was my sweater for last year's OAL as well, but this year I kept the length as written. 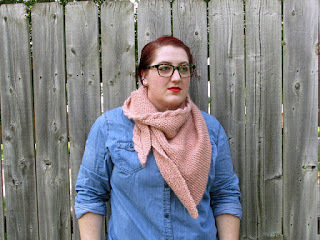 After finishing my hip-length Hetty last year, I knew right away that this pattern was a winner for me and that I needed a cropped version too. 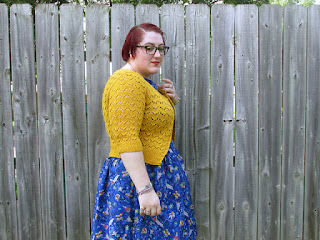 I also did some fooling around with gauge to knit this out of a lighter weight yarn than the pattern called for, and I'm really pleased with how the finished cardigan came out. It still doesn't have buttons, but that's not keeping me from wearing it. I'll be going through the city next month on my way to NCFF, and I'm planning on stopping to look for buttons then. I am almost caught up to where I was before I had to rip back on this sweater, and it feels good to be seeing it take shape. This week I've been dogsitting for my parents, so I've been knitting on this quite a bit instead of bringing a bunch of projects to their house, and the monogamous knitting time is paying off. It's been interesting, being back in my parents' house for an extended period again. I love my apartment, but it's been so great to go out back and see butterflies in their garden and hear the squirrels chattering in the walnut trees. It's a bit late in the season for this year, but next year I plan to get a planter to go by my back door and a bird feeder to go in front of the living room so I can see more wildlife around my apartment. It feels like the summer has completely flown by. This year I'm finding myself in a real "get things finished" mood. 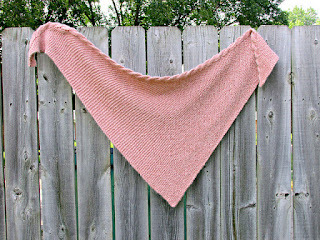 Having just finished the OAL and Bubblegum Spice, something in me is craving the satisfaction of getting things off the needles. Mottled Daydream is currently my second-oldest active WIP, having been cast on in May of 2015. And, honestly, this project is even older than that. 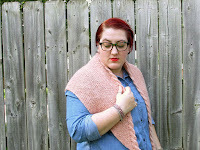 Way back in 2014 I tried knitting this shawl twice with a different yarn, but it never quite worked, so I set the pattern aside until I found this yarn in my stash. 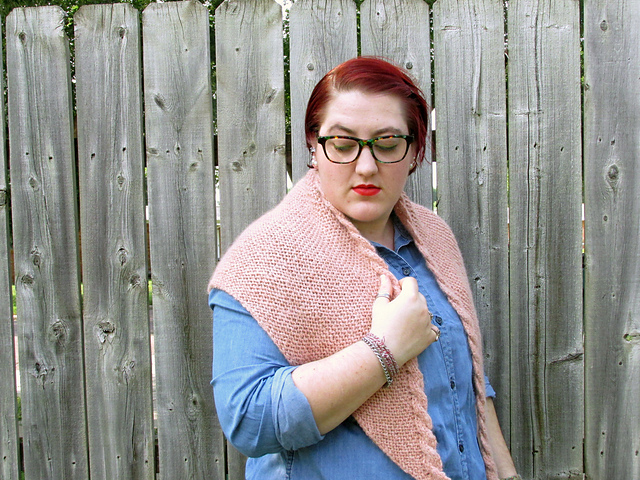 This shawl has been sitting in a basket for years, and I recently dug it out to bring along on a night out with friends, and it was the perfect thing to work on. I have no clue why I let it languish in a basket forever. I'd love to get this finished soon. 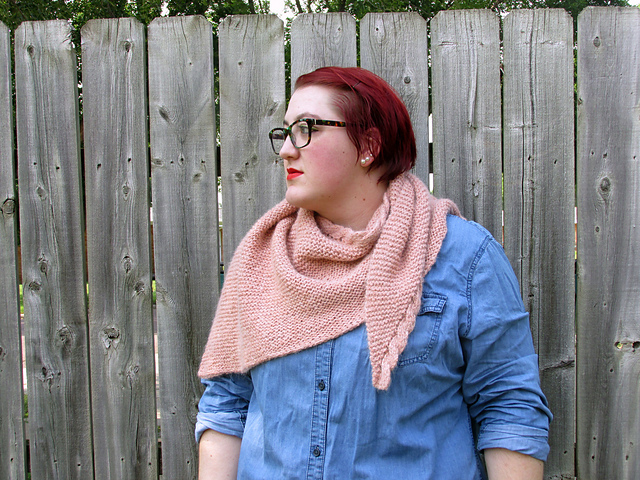 I really love this pattern, and the yarn is so soft, I'd love to be able to tuck it up against my neck this fall. 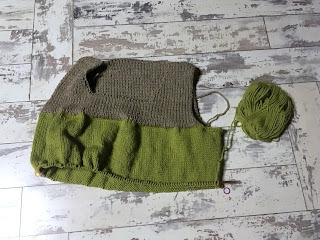 It's certainly not going to be finished quickly, but maybe a marathon stockinette project is just what I need right now. 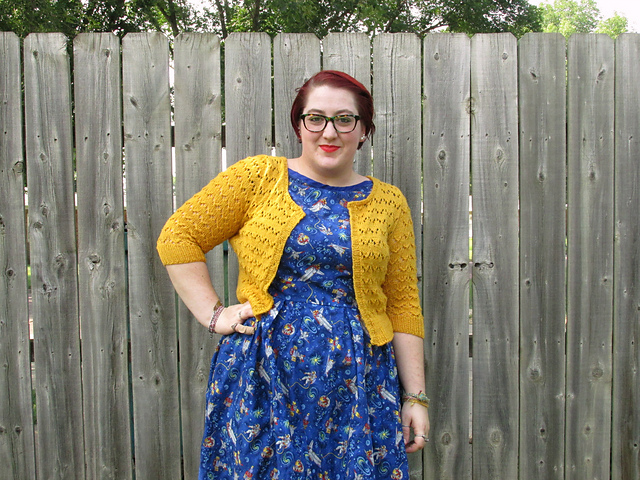 Community theater is done for the summer, but it always holds a special place in my knitting life. 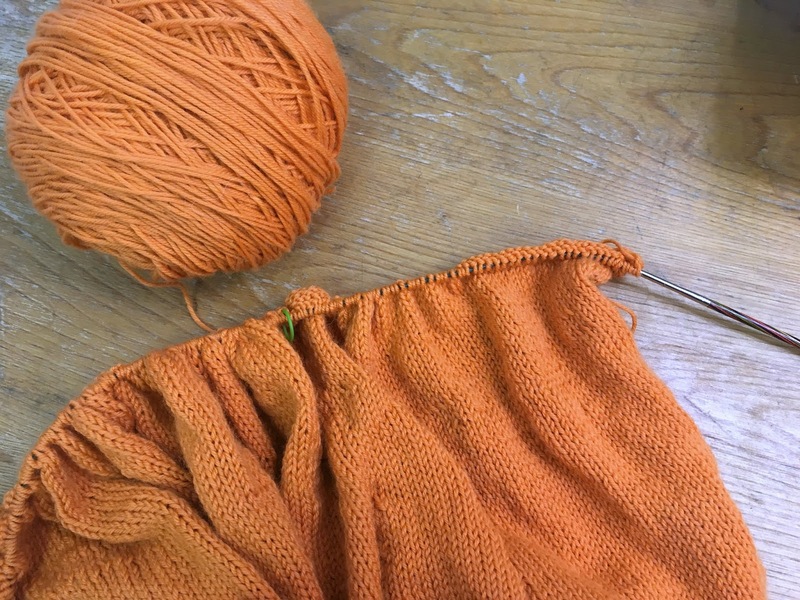 Knitting during play rehearsals can be tricky - it needs to be something that won't get finished too quickly, but I also need to be able to put it down in the middle of a row if I need to. Recently my good friend Annika released Olympic Boulevard, and I immediately wanted to cast on. So I downloaded the pattern to my phone, grabbed a skein of yarn from my stash, and headed over to play rehearsal. But as I sat winding the yarn into a ball, I realized that what I thought was a variegated skein was actually a self-striping gradient! 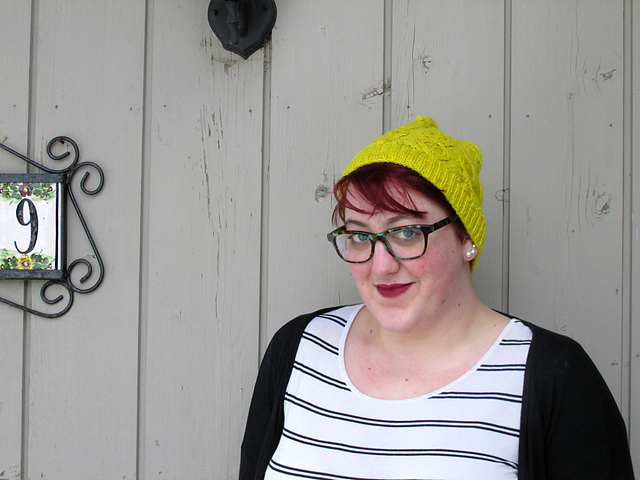 I love a gradient, but I hate letting any of the color progression go to waste, so I knew a hat wasn't going to work. HOWEVER, if I knit a cowl, I could keep going until all the gradient had been knit up! So that's what I did. 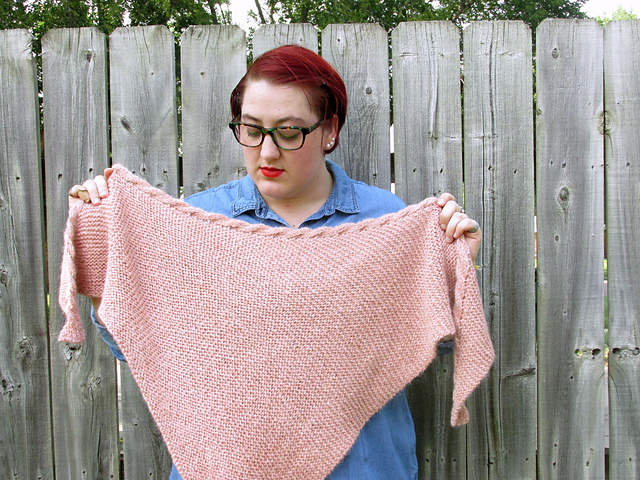 This is just a stockinette tube with eight rounds of k1p1 ribbing at the bottom and the top. I'm really pleased with how it came out, and I absolutely love the gradient with the darker stripes in it. 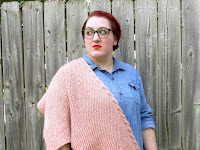 I still need to dig around in my stash for a better yarn for Olympic Boulevard, but, knowing my stash, I'm sure I'll find something. Yarn: ModeKnit Yarn ModeWerk DK "Night Cirus"